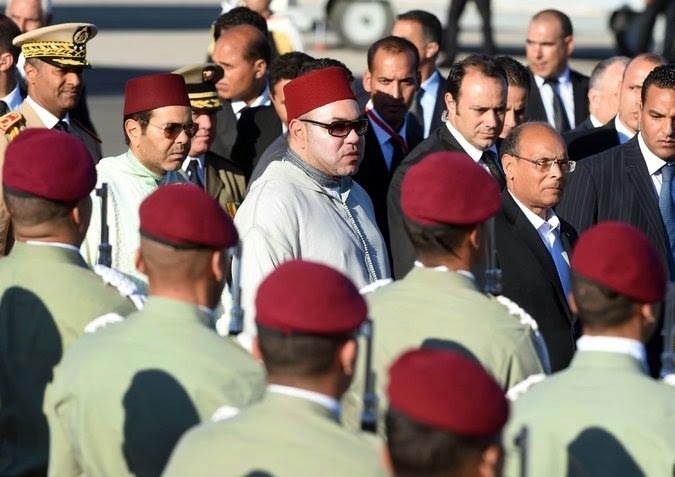 RABAT, Morocco — A few weeks shy of his 15th anniversary as Morocco’s ruler, King Mohammed VI was spotted on the streets of Tunisia in jeans and a T-shirt while on an official visit, living up to the King of Cool nickname given to him by the foreign news media. Back in the kingdom, however, tensions have been rising. Pro-democracy activists and journalists have faced increasing repression, as the government tries to tame an opposition emboldened by the 2011 Arab revolutions. One journalist, Ali Anouzla, is risking up to 20 years in jail on charges of promoting terrorism for reporting on a video that is thought to have been made by a militant group, Al Qaeda in the Islamic Maghreb. The video attacked the monarchy and called for jihad in Morocco. Another journalist, Mustapha Hassnaoui, is serving a four-year sentence for what the government said were his connections with jihadists in Syria. Mr. Hassnaoui started a hunger strike in late May to protest his detention. Mouad Belrhouat, a rapper who was the face of the pro-democracy February 20 Movement in 2011, is on trial on what he calls trumped-up charges of illegally selling the state’s soccer tickets. Many activists involved with the movement were recently sentenced from six months to one year in jail for participating in a union protest on April 6. In 2011, when Moroccans took to the streets, the king responded swiftly to the growing dissent by promising a complete overhaul of past undemocratic practices, more freedom and respect for human rights. He also allowed the creation of a new Constitution, a ploy that his father, King Hassan II, resorted to seven times when facing crises during his 38-year reign. Hassan II died in 1999. But many say Mohammad VI’s changes are purely cosmetic. The departing United Nations high commissioner for human rights, Navi Pillay, said there was a lack of political will to carry out promised reforms, particularly human rights projects. Human rights activists said there had been much fanfare but little change. But opposition has grown significantly since the February 20 Movement, reflecting Moroccans’ increased willingness to challenge the government. “A major part of the political class refused to discuss in public real issues concerning the ills of our society, namely the role of the monarchy, respect for human rights, the distribution of wealth and the separation of powers,” said Marouane Morabit, 28, an activist based in Casablanca and a staunch supporter of the February 20 Movement. That is different now, Mr. Morabit said, even though speaking up had fatal consequences for his friend, Karim Lachkar, who died under mysterious circumstances in police custody on May 27 in the northern city of Al Hoceima. Still, the authorities have no fear of targeting individuals such as Mr. Anouzla, and Morocco’s judicial system will not prove helpful to them, experts say. “The state jails any activist if it wants to. Law matters little here,” said Reda Oulamine, a lawyer based in Casablanca and the president of Law and Justice, a group dedicated to establishing the rule of law in Morocco. “There is still no independent judiciary despite the new Constitution, which was implemented to soothe the street,” said Mr. Oulamine, adding that there had been “some progress with the creation of the brave Club of Judges,” formed by hundreds of magistrates in 2011 to demand more independence for the judiciary. On several occasions the justice minister, Mustapha Ramid, has denied allegations that the government had tortured detainees and filed trumped-up charges against dissidents. He says the state is not responsible for individual abuses of power. Lawmakers talk about addressing the judicial system’s shortcomings and expect to introduce legislation on human rights protections in the next few weeks. Experts say the kingdom has astutely discredited the major sources of political opposition, effectively defusing the anger and frustration of most Moroccans. But that strategy has limits, many believe.